Beebe Library in Wakefield is a busy, medium-sized library serving a population of 25,000. We have a variety of historical collections, including photographs, postcards, maps, local government documents, and more. Boston Public Library has been invaluable in helping us digitize these materials for better access and preservation, scanning our maps, annual town reports, school yearbooks, and local history monographs for the Internet Archive. However, we’ve also worked on a number of other projects that we could manage ourselves. Two of these collections in particular are worth noting. Lyon (no tigers! ), but METADATA? – Oh My! Lyon Chapel at FPB, named after William Henry Lyon, Sixth Minister, is a lovely space where spirits are moved, ideas are exchanged and plans put into action. This is where ‘archives talk’ evolved into the Archives Project, driven by several factors: In 2012 the basement flooded. The rescued records were moved to premium space that administration could put to other use since our parish is growing; I, a trained Archivist, finally had time to commit to volunteering; and, FPB is anticipating its’ Tercentennial in 2017. During coffee hour over several Sundays, parishioners, the Minister and committee members expressed interest in access to historical records for a variety of reasons. These reasons in turn became the driver for joining Digital Commonwealth. Certain record series have high informational value for ongoing planning, strategic initiatives and reference purposes. We want to digitize these series so multiple committee members can access them remotely, so that Dr. Rev. Sherblom can search sermons by keyword, and to enable parishioners and the community at large to discover and explore our 300 years of evolution as a community of worship and social action. During the Digital Commonwealth Conference (2014), I spoke with BPL Digitization Services staff. I described where the records were on the continuum of arrangement and description. In preparation for developing work plans for our processing priorities, I wanted to obtain their spreadsheet to capture required metadata before processing is begun. As it turns out, the spreadsheet is being revised, and the actual first step is submitting the online application for digitization services – DONE! The next step is a Team site visit, scheduled for early July. I’ll report on my second step down the “road of yellow bricks” next month! Posted in Member projects, Uncategorized. A group of 14 public librarians gathered at the Boston Public Library on April 16, 2014 for the Public Librarian Partnership Program (PLPP). This is the first of three workshops offered by the Digital Public Library of America (DPLA) to work directly with public librarians across the state to produce an exhibit of national interest from the wealth of material in the various archives . The goal is to have a total of 45 librarians attend these one day workshops by August 2014. Presenters from the Boston Public Library for the April workshop were Anna Fahey-Flynn (Collaborative Library Services Manager), Danny Pucci (Lead Digital Projects Librarian) and Nichole (Metadata Mob member). Representing the Digital Public Library of America (DPLA) were Amy Ruddersdorf (Assistant Director for Content) and Franky Abbott (Project Manager). Information was provided in a well organized, empowering and collaborative way and throughout the workshop we were reminded of the network and assistance available through BPL and the network that is being created. Initially, there was an overview of the PLPP and how the various agencies – DPLA, BPL and Digital Commonwealth — work together cooperatively. Material was presented on evaluating an institution’s collection for material that has local significance but will interest a national and international audience. Issues such as raising awareness on copyright and urging the use of Creative Commons were discussed along with creating metadata and making use of help available through the Metadata Mob at the BPL. Some interesting themes emerged as possible exhibit topics: fires, floods, or other disasters; Civil War and World War I; shoe, textile, and optical industries – many, many possibilities! The participants were excited with the seemingly endless number of possibilities and discussed the various aspects of potential collaborations. The tour of the BPL Digital Imaging Lab, the Internet Archive, and the Metadata Mob office was excellent as it was an opportunity to finally meet all these great folks that have made the digitization of so many new collections by Digital Commonwealth members possible and who have guided all these collaborative projects through the various processes. And at the end there was an opportunity to visit the Dear Boston exhibit! Kudos to the curators! For a schedule of the workshops and registration information visit this blog post: http://blog.digitalcommonwealth.org/?p=264. Posted in DPLA, Member projects. the participants, including Carol Kelly, who kindly offered to summarize the event in this blog post. Additional metadata work parties will be scheduled in the future. Please email nheywood@masshist.org for more information. If the term “metadata work party” doesn’t excite you then you’d want to skip this workshop. But if you’re like me and already elbow-deep in digitization, sort of learning new skills as you go and hoping you’re getting it right – this was the place for you. We understood that the Digital Commonwealth folks were piloting this program with us and planning on offering more of this sort of thing so it’s worth a short critique….it was great. Does that seem a little too non-evaluative? Let me add details. The introduction helped me get a clearer grasp of what the Digital Commonwealth (DC) is doing and how they’ll harvest the metadata we develop in our individual projects. I was especially interested in understanding that the DC can host the metadata for a collection that our home libraries may keep on their server or host the actual collection. We also were reminded that the DC will assist in digitization but that we need to provide the metadata. Then they got right to the very complete set of links they’d organized for us. you standardize how you refer to people/places/things so they can be sorted and organized easily. The workshop offered us links to authority files on, among other things, geographic names, images and the lovely MODS file from the Library of Congress. ( Go and look at it http://www.loc.gov/standards/mods/) So rule one in developing metadata – use the authority files! These links alone were worth the drive to Southbridge. Then we moved right to the “work” part of the meeting. Tom Blake, Digital Projects Manager, and Danny Pucci, Lead Digital Projects Librarian, had brought additional BPL staff along, laughingly named the metadata mob. * As we began creating the metadata for the images we’d brought with us, each group got one of these highly skilled people to sit with us, looking over our shoulders, answering all our particular questions and guiding us to figure out how to bounce between the authority files and the form from the Digital Commonwealth. There’s nothing like doing something with an expert to coach. I think we all felt we got it and can easily move from this little workshop to creating good metadata files that will easily translate to the Digital Commonwealth website and provide access to everyone. As I said before – it was a great workshop. Posted in Member projects, Training. Digital Commonwealth will be hosting 3 upcoming workshops to prepare public libraries to contribute content to the Digital Public Library of America (DPLA) as part of a Public Librarian Partnership Grant recently awarded to DPLA by the Gates Foundation. The ideal candidates for these workshops will be public librarians who deal with local history, genealogy and similar unique content. If interested, registration is now available. Posted in DPLA, Member projects, Training. Kim and Deb noticed that the session generated many positive responses! Many attendees stated that they planned to use Digital Commonwealth’s website. Also some indicated they would explore opportunities to interact with their local cultural organizations that either are, or could be, Digital Commonwealth members and encourage these organizations to make digital content available via the new repository. Metadata Creation is a GAAS! The following is a guest post by Amy Benson, who has been working the past year under the auspices of the Boston Public Library to review Digital Commonwealth member metadata issues. My recent collaboration with the BPL, to prepare metadata from a number of libraries for the Digital Commonwealth Repository, has been a pleasure and a great learning experience. That’s one reason for the title of this post. The other is that each of the letters represents a basic principle to keep in mind when it’s your turn to create new, or enhance existing metadata. G for Granularity: The discovery is in the details. Use existing local expertise to record place names, people’s names, landmarks, and other specifics. Transcribe text from signs, labels, posters, etc. In short, describe items at the smallest useful level that your resources allow. A for Automation: Use available tools to facilitate your work. If existing metadata is in a printed document, consider scanning and using OCR to capture the text electronically. If you have data in one system, explore options with a vendor or IT person for exporting and repurposing it. A for Authority: Follow metadata standards appropriate to the materials you are describing, such as RDA, LCSH, Getty vocabularies, or Library of Congress Thesaurus for Graphic Materials. S for Structure: The more structured your data is, the more useful it can be. Splitting first and last names and using start and end dates instead of a date range will yield more powerful search and delivery options. It is much easier to combine data that’s been separated than it is to separate blocks of text. Structure your data by putting each element in a separate spreadsheet cell, by using special punctuation in a text file, or with XML tags. Following these basic principles when creating metadata is more important than focusing on one metadata schema or tool. Systems come and go, but data endures. 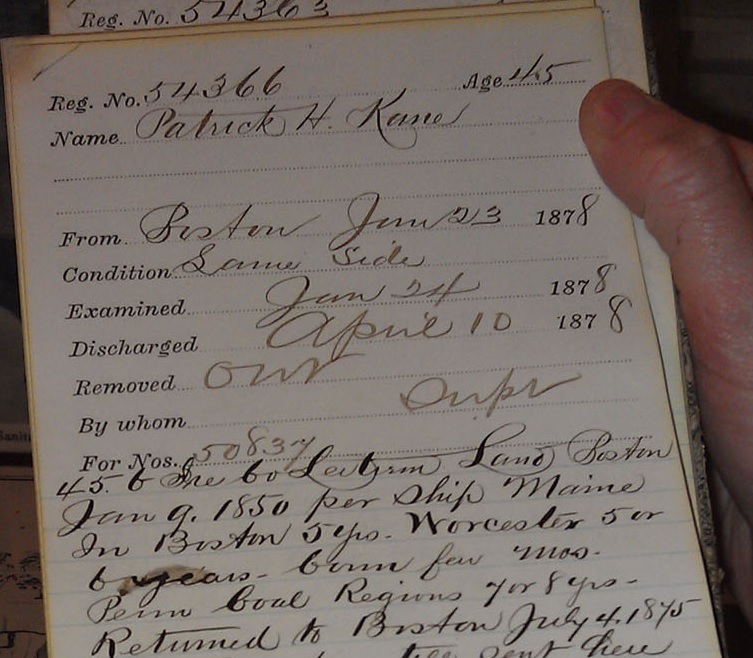 Descriptive information written in library hand a hundred+ years ago has been transcribed and enhanced and is helping users locate resources in our online databases today. With the right transformations, the same metadata you create for a local system can be made available in Flickr, the Digital Commonwealth, or the Internet Archive – from pencil and paper to MARC, MODS, JSON, and beyond. Get more mileage out of the GAAS in your tank and boost the usefulness, flexibility, and longevity of your metadata. Go for Granularity, adopt Automation, respect Authority, set up a solid Structure, and above all, be consistent and enjoy yourself. You are creating a lasting resource to make cultural heritage materials more available and useful to all. 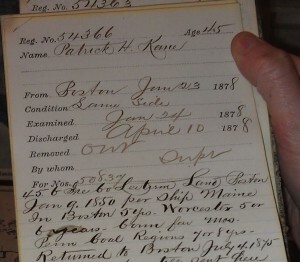 The Public Library of Brookline has worked with the Digital Commonwealth since 2007 when Anne Clark uploaded 10 historical photographs into the repository, and provided feedback on the data entry and batch uploading process. From this beginning, Anne Clark and I selected the historic Brookline photographs to be digitized by a local company, Boston Photo Imaging, and with funding from our Board of Library Trustees we were ready to proceed. Anne Clark, Colin Wilkins and I provided the metadata for the photographs; once this task was completed everything was uploaded to the Digital Commonwealth repository. Pleased with the results we proposed a second project digitizing our glass plate negatives. Boston Photo Imaging scanned the negatives and saved the images to an external hard drive. We followed the same procedures as in the first project and these 101 images are now available in the Digital Commonwealth repository. At the Digital Commonwealth Annual Conferences March 25, 2010 Anne Clark & I presented a session “Bringing the Past to the Future: The Digitization of the Historic Photograph Collection of the Public Library of Brookline”. We also shared our experiences at the April 26, 2011 Digital Commonwealth conference in the session, “From Your Archive to the Web: Managing the Project”. We encouraged libraries to ask questions, consult the experts and ad their collections to Digital Commonwealth. We applied for digitization services from the Boston Public Library to have digital images created of our identified and numbered manuscript collections. The BPL’s Library for the Commonwealth program enables BPL staff to provide free digitization services to Digital Commonwealth members who want to make their collections available in the repository. Our materials are now at the BPL being digitized by their state-of-the-art equipment. Soon our Brookline High School yearbooks will also be available through the Internet Archives. Once our materials are returned we will begin the metadata entry. We are very fortunate to have the resources and expert staff of the Boston Public Library working to help to libraries and historical societies in the Commonwealth share digital collections. Read more about the BPL’s digitization services for Digital Commonwealth members in this blog post: http://digitalcommonwealth.org/blog/?p=113. When the Boston Public Library announced their grant to digitize local collections and preserve them in the Digital Commonwealth, it seemed like a great opportunity for my small library to create our digital archives. I had worked with teams from BPL on a number of other projects and workgroups, and looked forward to collaborating with their staff on this exciting project. Boston Public Library had state-of-the-art equipment and a whole team of experts, who would work with me every step of the way to provide guidance and counsel. Joining the Digital Commonwealth was the easy part, but when Thomas Blake, Chrissy Rissmeyer, Danny Pucci, Bahadir Kavlakli, and Jake Sadow first visited my library in 2011 and told me I would be creating metadata, I wondered what I was getting into! While I had catalogued, indexed, abstracted, and classified for decades, I had never actually created metadata. No worries, they told me – I would be given a step-by-step template that would guide me in the process. The template arrived in easy-to-understand MS Excel, with recommendations and notes for genres, extents and formats. Soon I was delving into a world of tools and standards like the Graphic Materials: Rules for Describing Original Items and Historical Collections and the Library of Congress Name Authority File. While the process took a great deal of time (about a year to create metadata for about 300 materials), the BPL Digital Commonwealth Team was with me every step of the way, answering my questions by phone, email and in person. I found that completing the metadata was fun, exciting, challenging, and opened up a whole new world. And there were some things I just couldn’t verify, such as photographers from 1917. While most of my genres were photographic prints or book illustrations, I did have some others, such as oil paintings, certificates and architectural drawings, where I had to hunt for the correct metadata in databases. After I finished and sent in the completed spreadsheet, I received an edited spreadsheet and detailed five page report from Danny, Nicole Shea, Amy Benson and Sarah Emily, where everything was mapped to unique identifiers for each book or image. Their expert advice and recommendations helped me to complete the metadata for over 8,000 fields and prepare the records for the “final send-off”. One of the highlights of the project was bringing the last three books to BPL and getting a guided tour of their impressive digitization lab, cameras and equipment. Now as I eagerly await my collection to be posted on the Digital Commonwealth, I am already being contacted by researchers who have discovered books the BPL team had posted to the Internet Archives from the Faulkner Hospital Collection. Since these materials were posted in the fall of 2012, they have been downloaded almost 1,500 times. So, accidental metadatalyst or not, the collection has proved discoverable, thanks to the Boston Public Library Digital Commonwealth Team.